Jeff Baena's first feature as director is a respectable zombie-comedy, unfortunately hampered by a sense of deja vu when it comes to the material. There are a few clever ideas here, but an over-reliance on the old familiar tropes, and the ubiquitous use of comedy character actors all vying for attention does make it a bit of a mixed bag. Having said that, the film is well crafted and easily passes the laugh test by proving itself consistently amusing and playfully irreverent. Don't expect to be blown away, and you might find it a decent piece of entertainment and a fine way to spend an evening at the movies. There are some nice little touches to zombie mythology here too, as the living dead are not portrayed as outright flesh-eaters, but rather slightly lost and irritable souls who simply want to get back to their old lives. I liked the fact that the zombies only relax when listening to smooth jazz and muzak, which is a nice idea, and a cool nod to the mall music from Dawn of the Dead. It's also satisfying to see the gradual changes the zombie phenomenon has on the world the characters inhabit, from a brief shot of a background extra running for his life early in the story, to the eventual arrival of the military as things spiral completely out of control. Baena keeps the action limited to suburbia, thereby giving the story a more closed feeling and allowing Beth's return to appear as something of a small-scale problem in an otherwise problem-free world. The characters are less worried about 'zombies' as they are about 'the Beth situation'. It's nothing which we haven't seen before, but it's well handled and provides the film with a little more atmosphere and suspense. One of the problems is a general sense of familiarity to the story. Anyone who's au fait with zom-coms and zombies in general may not find much new here to chew on. Couple this with an ending which seems very rushed and slightly too Pollyanna-ish, and the film feels distinctly by-the-numbers. Admittedly, for the most part, the movie is completely acceptable, zipping along with snappy one-liners and good sight gags, occasional gore and special effects, but never quite seeming to become more than the sum of its parts. Despite being well constructed and with some strong performances (especially from Plaza and Reilly), the whole thing somehow manages to keep you at arms length. The issue facing any contemporary zombie film, comedy or otherwise, is a market which is now so stuffed with new additions to the genre that in order to get noticed you need to have something genuinely fresh and interesting to offer. Comparisons to Shaun of the Dead, which resuscitated the genre back in 2004, and Return of the Living Dead, which set the bar high as one of the first and very best zom-coms, are inevitable. 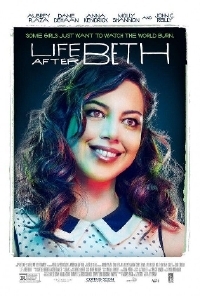 Life After Beth is not in the same league as either of those films, although I felt that it had more soul and more interesting characters than 2009's Zombieland, which struck me as a fairly cold and empty exercise in stylized violence, even if it was a superficially entertaining one.